This collection consists of two plantation journals kept by William Ethelbert Ervin at Liberty Hall Plantation between 1839 and 1856. The entries are very brief and note cultivation of cotton and other crops, hauling cotton to the Tombigbee River for shipment, cutting logs, killing hogs, and other activities. He also noted the weather each day. Ervin included information on buying and selling slaves, hiring slaves owned by others, providing slaves with blankets, hats, and other clothing, and paying slaves for their Christmas work. He made lists of slave birth (and some death) dates. In 1847, he wrote out the rules for slave conduct and punishments in case the rules were broken. There were rules for how to handle quarrels, duties of husbands and wives, absence from the plantation, and the obligation of slaves to be in their quarters by 9 p.m.
Ervin also mentioned his trips to town and attendance at court and at sales. He was a devout Christian and regularly attended church and Sunday school. On 28 February 1850, Ervin mentioned that four of his children were very sick, one with typhoid fever. 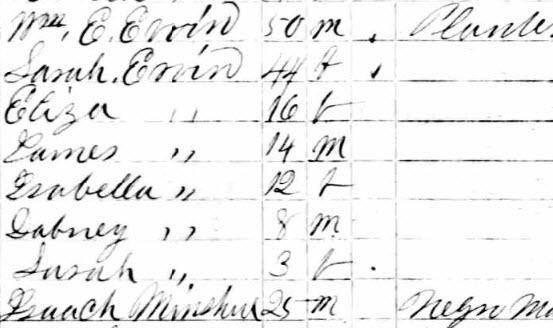 In addition to the daily entries, Ervin kept lists and memoranda on his farming activities. At the end of each year, he entered an account of total weights of cotton, sometimes crediting each of his hands with the amount they had picked. There are pages of miscellaneous accounts and memoranda including twists of tobacco sold to individuals and notes settled. After February 1851, the diaries contain records of his saw mill and grist mill. These entries continue through April 1854. 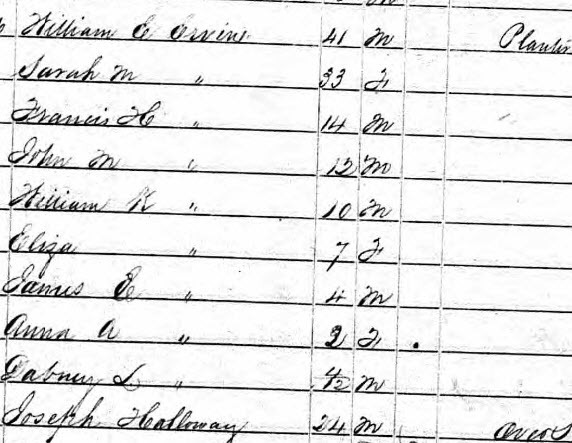 Following that date, there are some miscellaneous accounts through 1 January 1856.